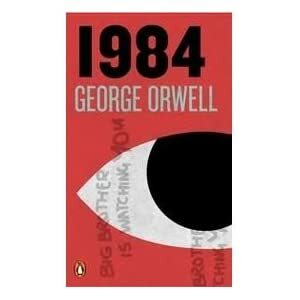 Written just after WWII in 1949, this book introduced "Big Brother" to our common vocabulary. Allusions appear in the Hunger Games that were introduced in 1984. Most of the group has not read this book, so we chose it for our May club meeting. George Orwell (whose real name was Eric Arthur Blair) was born in 1903 in India and then went to Eton when his family moved back to England. From 1922 to 1927 he served with the Indian Imperial Police in Burma, an experience that inspired his first novel, Burmese Days (1934). He lived in Paris before returning to England, and Down and Out in Paris and London was published in 1933. After writing The Road to Wigan Pier and Homage to Catalonia (his account of fighting for the Republicans in the Spanish Civil War), Orwell was admitted to a sanatorium in 1938 and from then on was never fully fit. He spent six months in Morocco, where he wrote Coming Up for Air. During the Second World War Orwell served in the Home Guard and worked for the BBC. His political allegory Animal Farm was published in 1945 and it was this novel, together with Nineteen Eighty-Four (1949), which brought him worldwide fame. George Orwell was taken seriously ill in the winter of 1948 49 and died in London in 1950.